Do you all remember the cookie dough ice cream craze back in the 90's? People couldn't get enough of Ben & Jerry's Cookie Dough ice cream. I, however, was not one of those people. I thought it was okay, but definitely not in my top 10. It probably had to do with the fact that the chunks of cookie dough were nestled in vanilla ice cream. If you haven't already figured it out by now, I am a chocolate girl through and through. Now, wave a pint of a Ben & Jerry's Chocolate Fudge Brownie under my nose and I'm yours! At least long enough to pry the pint out of your hands and get my spoon in there. Even though I'm not a cookie dough fanatic, I have been intrigued by the cookie dough cupcakes I've seen on some of my favorite food blogs. 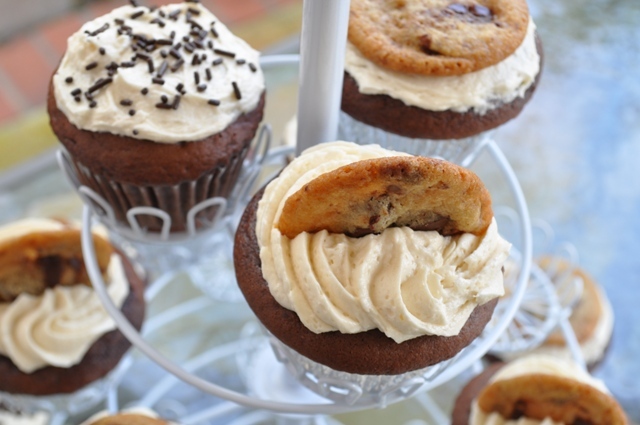 The cookie dough cupcake over at Tracey's Culinary Adventures is downright adorable. 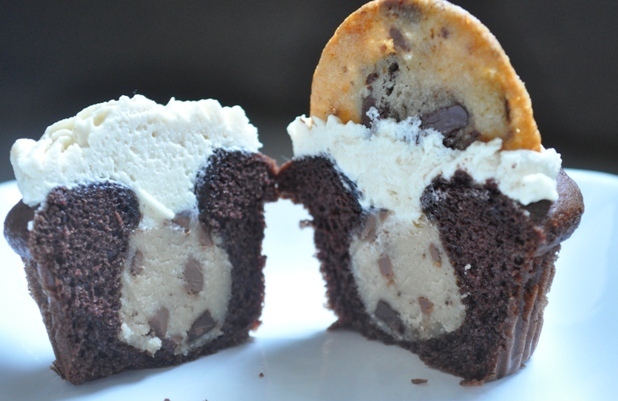 Kevin and Amanda's blog features a cookie dough filling that is actually baked in the cupcake. But it seems all the recipes I found online, at least in some part, center around the one found on Annie's Eats (which came from a few different sources). 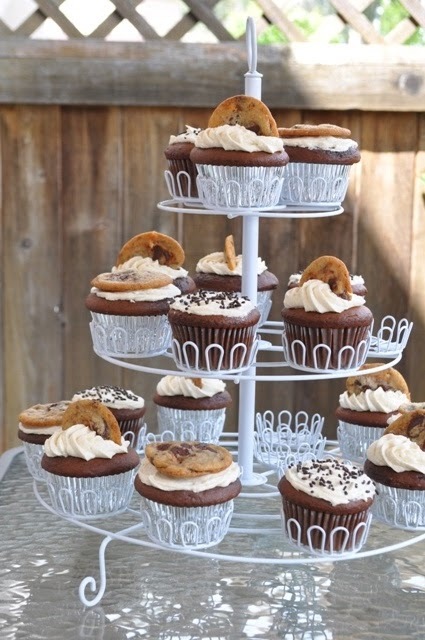 My brother and his 3 kiddos came over for a barbecue this past weekend and I thought they would be the perfect taste testers for the chocolate chip cookie dough cupcakes. What kid doesn't like cookie dough? I did switch up the recipe a bit and used a chocolate cake base instead of a white cake base. Had to get in a little something for us chocolate lovers. Okay, it was for me. And....the kids too....yeah. The chocolate cake was filled with chocolate chip cookie dough (an eggless version so that you can enjoy that raw cookie dough texture without fear of salmonella), frosted with cookie dough buttercream and topped with a homemade chocolate chip cookie. This cupcake is not for anyone watching their calorie or sugar intake. I cannot even fathom how many calories are in just one of these little babies. It's a rich and decadent treat and there's no doubt it's all about the cookie dough. Prepare to indulge! I have to pause to give a shout out to my awesome new cupcake stand. My gal pals gave me this really cool display for my birthday. And they also gave me this cupcake carrier that I keep meaning to photograph and share here...because I've already used it 3 times in the last 2 months. What's so cool about the carrier is you can bake cupcakes in it and then transport them. 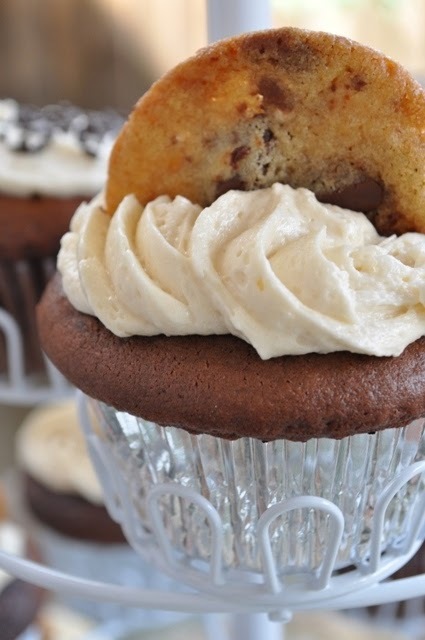 Back to the cookie dough cupcakes....In my research I found 2 approaches for the filling. 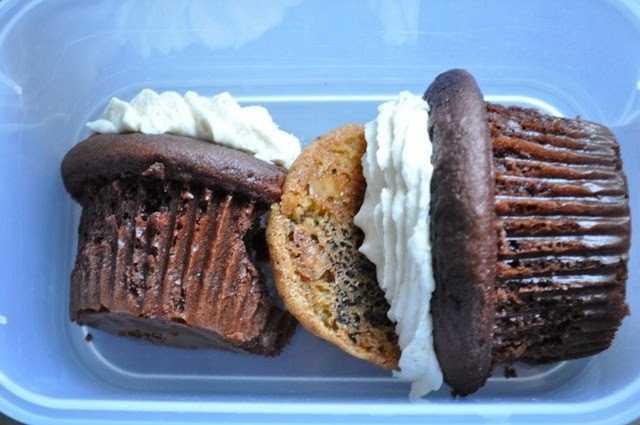 The most common was to bake the cupcake and then cut out cone shape from the top and fill it with cookie dough. The other option was to make cookie dough into balls or tube shapes and then freeze them (overnight if possible) and place the frozen dough in your cupcake batter and bake away. I went with option 2. On a side note, my cupcakes almost ended up with no filling because I popped these babies into the oven and about 90 seconds later realized they were missing their cookie dough filling. Whoops! I quickly pulled the cupcakes out of the oven and dropped in a ball of frozen dough. Because the dough is frozen it doesn't bake through and retains its cookie dough consistency. If you like a really soft cookie dough, you might try the bake and fill option instead. Now, let's talk frosting. It is just like cookie dough in taste and texture. This buttercream has confectioner's sugar and brown sugar, vanilla, salt and a bit of milk (if you need it to get to the right consistency). The brown sugar provides that slightly gritty texture that you get from cookie dough. The frosting is a pure sugar rush. Don't forget to top it off with a chocolate chip cookie! I did a little experimenting with the chocolate chip cookie. I adapted Melissa Murphy's chocolate chip cookie recipe and added a little extra butter and some toffee bits with milk chocolate. The cookie wasn't quite where I wanted it to be so I won't share the recipe today...but I have some ideas on how to get it closer to my ultimate chocolate chip cookie. The cupcakes were a hit with the kids! I've enjoyed a few over the last 3 days. Ate it for breakfast (maybe twice)....with a big glass of milk. Check out Annie's Eats for the buttercream frosting and her cookie topper recipe. You can find the chocolate cake recipe I used here and lastly, check out Kevin and Amanda for the chocolate chip cookie dough filling. Gloria,those cupcakes are so FUN and look scrumptious. 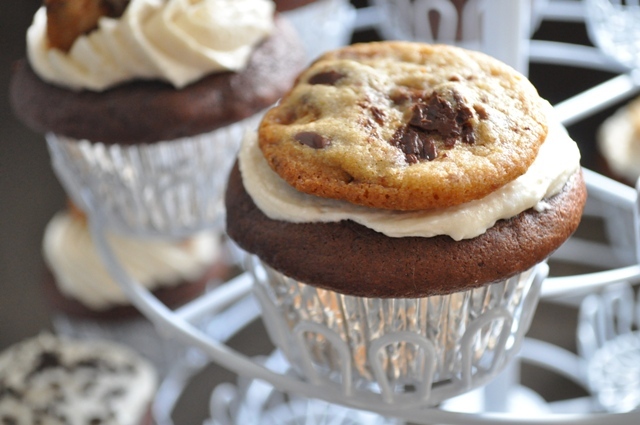 I love how you decorated the tops with an actual chocolate chip cookie too. A double treat! This really looks delicious. I'm definitely craving for a plate of that right now. Thanks for sharing this wonderful recipe. This is definitely a must do recipe this weekend since I got my Food Safety Certification.